Haiku: Peter Newton. Artwork: Kuniharu Shimizu. Light as a feather is the mood I get from this haiku, and visualized it accordingly by thin lines and pastel colors. Also I invented a font and hand-wrote the verse in a way that fits the haiku and the style of drawing. Without any preconceived intention, I just pick up pencil and doodle, drawing continuous line. After several trials, something usable for haiga results. 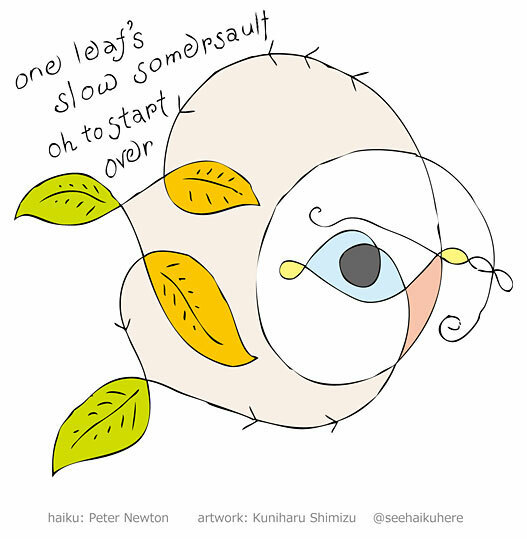 This is one of my favorite haiku of Peter's and I love your interpretation of it here, Kuni san. Indeed a fine haiku, Melissa san. My younger brother was a high diver, but his somersault not as elegant as a leaf. Love the font, the haiku and the artwork.